On the mornings I commute to the city from NJ, there are a number of routes I take from the bus drop off point at 42nd and 8th to my final destination at 48th and 5th. If someone cares to figure out the number of permutations that are available to me, please drop me a line, I'll try to hit up every single route. Math majors, calling you out. On these morning jaunts, I sometimes find myself walking along 43rd Street from 8th Avenue to 5th Avenue. At 126 West 43rd Street, construction is underway for the Bank of America Tower. This address used to belong to Henry Miller's Theater from 1918 to 2004. 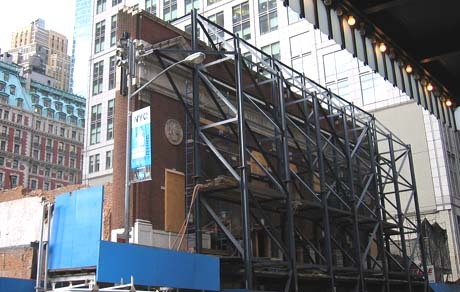 Two buildings obviously can't occupy the same place at the same time, so the architects had to save the facade which was landmarked by the city while knocking down the rest of the building. The facade will serve as an entry point into the tower while a new 950-seat Broadway theatre will be built below ground. I found the freestanding facade, though reinforced with an exoskeleton, to be impressive and unique. Enough so to warrant a post anyway. cool cool that facade thing is sorta the idea i had for my capstone. oh, and there are 18 ways to get from the port authority to rockafeller center. i think. it might best to just ask elmo. haha.